There are many different types of mycotoxins. 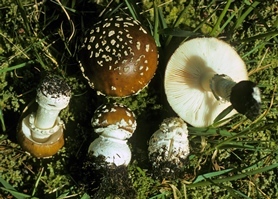 Of 14 distinctive types of mushroom poisoning found worldwide, so far about 10 distinctive patterns of reactions to mycotoxins have been observed in North America. However, since most mushroom species are rarely eaten, many toxins are poorly documented and syndromes not yet observed in North America may turn up as more and more people experiment with eating wild mushrooms. NAMA maintains a case registry where you may report instances of mushroom poisoning. The following list is not exhaustive. It is presented here for informational purposes, and should not be considered an aid to diagnosis. The images are shown as examples only and should not be used for identification. For emergency identification, please consult our list of volunteers. If you suspect that you have consumed a poisonous mushroom, contact a physician, or your local poison control center. It is important to file a report, even if the outcome was only a gastrointestinal upset. NAMA tracks ALL mushroom poisonings. The most frequent form of mushroom poisoning is caused by a wide variety of gastrointestinal irritants. The symptoms usually appear within 20 minutes to 4 hours of ingesting the mushrooms, and include nausea, vomiting, cramps, and diarrhea, which normally pass after the irritant had been expelled. Severe cases may require hospitalization. Supportive treatment may include attempts to eliminate the irritants. In all cases where there has been vomiting and diarrhea, measures to replace lost fluids and electrolytes are important. Recovery is complete, though a bout with severe gastro-intestinal distress may put one off ever eating mushrooms again! IMPORTANT: If the gastrointestinal distress begins 6 to 24 hours after ingestion of the mushrooms, there is a possibility of a very serious toxicity from Amatoxins (see Amanitin). GI onset of 4-11 hours with impaired kidney function could be due to Allenic Norleucine (2-amino-4,5-hexadienoic acid). GI onset greater that 24 hours and up to 21 days could be due to Orellanine. Mushrooms: Inocybe species, Clitocybe dealbata, and several relatives, Omphalatus species, and certain red-pored Boletus. The symptoms usually occur within 15-30 minutes of ingestion, and are focused on the involuntary nervous system. They include excessive salivation, sweating, tears, lactation (in pregnant women), plus severe vomiting and diarrhea. These symptoms may be accompanied by visual disturbances, irregular pulse, decreased blood pressure, and difficulty breathing. Victims normally recover within 24 hours, but severe cases may result in death due to respiratory failure. Atropine is a specific antidote, but must be administered by a physician. Dogs are particularly susceptible to the toxin muscarine. 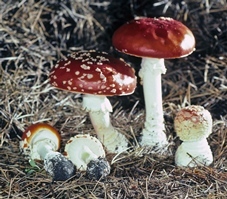 Mushrooms: Amanita muscaria, A. pantherina, A. gemmata, Amanita multisquamosa (syn. 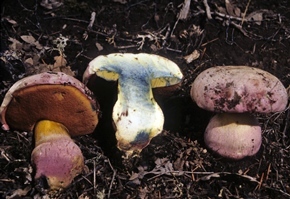 A. cothurnata), A. frostiana, A. crenulata, A. strobiliformus, Tricholoma muscarium. There is a great deal of confusion concerning these toxins, and much misinformation about their treatment. Atropine is NOT indicated in cases of poisoning by ibotenic acid or muscimol but is frequently cited as a treatment for A. muscaria poisonings in the medical literature, where the toxin is erroneously listed as muscarine! Atropine's effects are close to those of ibotenic acid, and may even exacerbate the symptoms. Symptoms appear within 30 minute to 2 hours after ingestion, and last for several hours. Nausea and vomiting are quite common, but the principle effects are on the central nervous system: confusion, visual distortion, a feeling of greater strength, delusions and convulsions. Drowsiness is a common symptom, and many who ingest these mushrooms fall asleep and can not be roused. In rare cases the coma-like state can last for more than 24 hours. This facet of the syndrome can be particularly frightening for the attending physician, as most cases involve patients who arrive in this apparently comatose state. The resulting panicked reaction and overtreatment, generally produces no benefit to the patient. In humans, there are no reliably documented cases of death from toxins in these mushrooms in the past 100 years, though there is one case where a camper froze to death while in the comatose state. Dogs and especially cats can die from these isoxazole toxins, though it is important for the vet not to euthanize an animal even though the chances for recovery appear remote — once the animal awakens from the comatose state recovery is normally complete over the course of a week or so. Treatment of humans and animals is largely supportive. Measures to reduce anxiety can include reassuring the patient that the effects are only temporary. If there has been extensive vomiting and diarrhea, measures to replace fluids and electrolytes can speed recovery. Recovery is normally spontaneous. 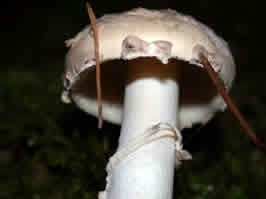 To reiterate: Muscarine plays no documented clinical role in poisonings by Amanita muscaria or A. pantherina. Atropine is not indicated. Mushrooms: Amanita phalloides, A. ocreata, A. verna, A. bisporigera, Conocybe filaris, Galerina marginata (syn. G. autumnalis), G. venenata, Lepiotia castanea, L. helveola, L. subincarnata (syn. L. josserandii) , L. brunneoincarnata, L. brunneolilacea, and close relatives. Extremely Serious. The fatality rate for Amanitin poisoning is about 50% without prompt, knowledgeable medical treatment, but is about 10% in the U.S. and Canada where good medical care is readily available. Amatoxins are doubly dangerous due to the fact that the symptoms are delayed for 6 to 24 hours after ingestion, by which time the toxins have been completely absorbed by the body and after the initial state of gastric distress, the patient may appear to recover about day two or day three and be sent home. Monitoring of liver enzyme function is critical in cases of delayed onset GI distress! First stage is a latency period of 6 to 24 hours after ingestion, in which the toxins are actively destroying the victim's kidneys and liver, but the victim experiences no discomfort. Second stage is a period of about 24 hours characterized by violent vomiting, bloody diarrhea, and severe abdominal cramps. Fourth stage is a relapse, during which kidney and liver failure often occurs, leading to death. Patients may also “bleed out” and die due to the destruction of clotting factors in the blood. There may be more than one relapse. If you have any reason to suspect that someone has ingested an amanitin-containing mushroom, DON’T WAIT for symptoms to appear! There is no antidote for amanitin poisoning, and the best hope is to rush the person to the hospital where the toxins can be removed before being fully absorbed into the body. Seeking prompt medical treatment when amatoxin poisoning is suspected is critical. Since the symptoms (NOTE: in the most serious cases, severe diarrhea can begin in as little as 6 hours post ingestion) typically do not appear until 12 or more hours after ingestion of an amatoxin containing species, activated charcoal to remove the toxins from the GI tract is ineffective. In all but the most severe cases, aggressive IV fluid treatment can slowly flush the toxins from the system in the excreted urine. Liver enzymes levels and blood clotting factors must be closely monitored. In severe cases (as measured by liver enzyme levels and blood clotting factors) experimental use of IV silibinin and other measures may help enough that a liver transplant can be avoided. Use of penicillin is no longer considered effective. 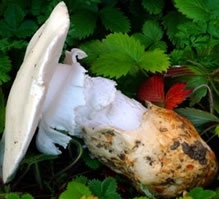 For a full review of treatment strategies see "Amatoxin Poisoning in North America 2015-2016"
Mushrooms: Gyromitra esculenta and possibly G. ambigua, G. infula. 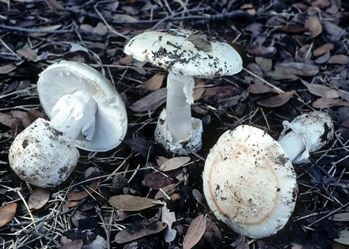 Note Several additional Gyromitra spp., notably G. montanum, G. gigas, G. fastigiata (=brunnea), G. californica, G. sphaerospora and also many related Ascomycetes, such as some species of Helvella, Verpa, and Cudonia spp., even Morels can cause upset if consumed raw or not thoroughly cooked, though the toxins are not clearly known in most cases. Gyromitrin's product of hydrolysis is monomethylhydrazine (MMH), a colorless, volatile, highly toxic, carcinogenic compound, first discovered and used for it's hypergolic properties in combination with nitrogen tetroxide. MMH is used by NASA as rocket fuel, which should give some idea of what is meant by "volatile". 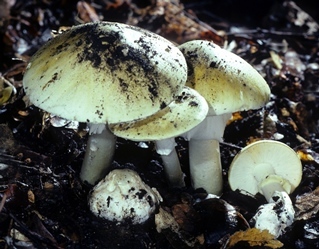 "Volatile" also means that gyromitrin has a low boiling point, and thus mushrooms containing it can have a puzzling non-effect on some, whereas others are severely poisoned. In Europe, it has sometimes only been the cooks who have died from Gyromitra esculenta. The dividing line between a "safe and "lethal dose" is very slim. Symptoms appear within 2 to 24 hours and include headaches, abdominal distress, severe diarrhea, and vomiting. In severe cases, liver, kidney, and red blood cell damage may occur, possibly resulting in death. Treatment is largely supportive, and a physician should be consulted. Gyromitrin is also a known carcinogen, so consuming a less than toxic dose may also cause trouble down the line. Mushrooms: Cortinarius orellanus, C. rubellus (=C. orellanoides, C. speciosissimus, C. rainierensis), and C. gentilis. C. splendens, C. atrovirens, and C. venenosus, may possibly cause orellanine like poisoning. Extremely Serious. Onset of symptoms from orellanine poisoning can be very greatly delayed (as much as three weeks), the toxin isn't very well understood, and specific treatments are not available. In Finland, rats fed either dried Cortinarius orellanus or dried Cortinarius gentilis suffered severe kidney impairment. 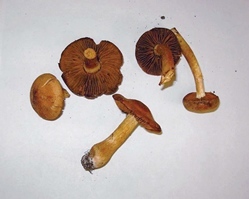 The only orellanine poisoning in North America involved kidney failure in a Michigan woman who consumed a Cortinarius species similar to Cortinarius orellanus but found under oaks in 2008. 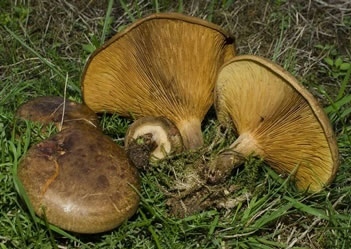 In 2010 this new species was named Cortinarius orellanosus. Symptoms occur within 36 hours to 3 weeks of ingestion (average is about 8 days), and include nausea, vomiting, lethargy, anorexia, frequent urination, burning thirst, headache, sensations of coldness and shivering (fever generally absent), evidence or progressive kidney failure. Beyond the standard management of kidney failure, there is little but supportive treatment of use in cases of orellanine poisoning. Patients with severe, but not irreversible damage may begin to recover kidney function between two and four weeks after the onset of symptoms. NOTE: The compounds involved in this syndrome show a very strong uv fluorescence. Both the mushrooms and tissues of the poisoned individual will exhibit this fluorescence. 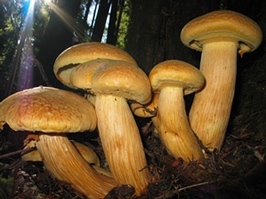 Mushrooms: About 20 Psilocybe species including P. cyanescens, P. stuntzii, P. cubensis, and P. semilanceata, several Panaeolous species including P. cyanescens and P. subbalteatus, at least three Gymnopilus species most notably Gymnopilus spectabilis plus at least one Mycena, one Pluteus, one Conocybe and one Inocybe. These indoles are well-known as hallucinogens, and these mushrooms have played important roles in religion and medicine in some parts of the world, notably in South America. Their properties were "rediscovered" by mycologists in Oaxaca in the 1930s, and studied by mycoethnographers Gordon and Valentina Wasson in the 1950s; their chemistry was documented by Albert Hoffmann. 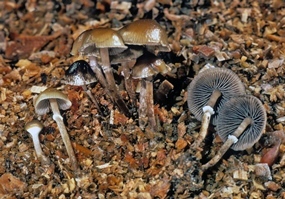 Both psilocybin and psilocin are found naturally in mushrooms, though their ecological purpose is unknown. In the human body, they affect the serotonergic systems in the brain, and show some cross-tolerance with substances such as LSD. Onset of symptoms usually occurs within an hour of ingestion, and effects typically last up to four to six hours. Effects are primarily psychological and perceptual, including heightened color perception, emotional effects such as religious ecstasy or anxiety, and sometimes hallucinations or delusions. 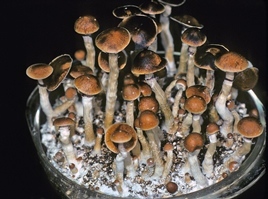 As with any other psychologically-active substance, mindset and situation can greatly influence psilocybin's subjective effects. Care should be taken not to frighten or upset a person under its influence, and if a victim does become anxious, to reassure them that the effects are temporary. Little research has been done on antitoxins, but tryptophan may have a mitigating effect. Nausea and vomiting are sometimes associated, but generally occur earlier than the psychological effects, and may be associated with other toxins present in some psilocybin-bearing species, rather than with the indoles themselves. A very few severe reactions, including fevers and deaths, have been reported in contexts of psilocybin poisoning of small children; "grazing" accidents by toddlers should be treated in a hospital. Perhaps the greatest danger posed by psilocybin as a mycotoxin is that the mycologically ignorant may, in hunting for "magic mushrooms," find themselves consuming something different and far more dangerous. Galerina marginata (Syn. 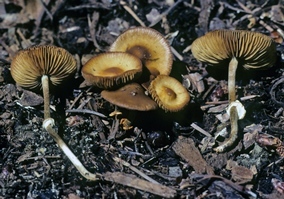 G. autumnalis) and other amanitoxin-bearing "little brown mushrooms" may be mistaken for hallucinogenic species. There has even been a report of children inhaling the spores of Lycoperdon puffballs in the hopes of "getting high," only to wreak havoc on their lungs. 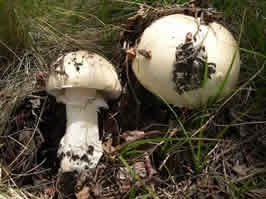 Mushrooms: Amanita smithiana, A. proxima, A. pseudoporphyria. Note: A compound, chlorocrotylglycine, may also be toxic. 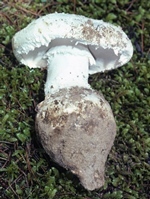 Amanita smithiana has caused numerous poisonings in the Pacific Northwest, where it is possibly being mistaken for the popular Matsutake, or "Pine Mushroom" Tricholoma magnivelare, to which it bears a superficial resemblance. Many physicians have been quick to attribute these poisonings to orellanine, and indeed there are some obvious similarities in the symptoms. However, onset of symptoms is more rapid in cases of A. smithiana poisoning (between 4 and 11 hours, compared to orellanine with a 36 hour to 3 week onset period). A. smithiana causes gastrointestinal distress, anxiety, chills, cramps, disorientation, kidney failure and sometimes malaise, sweating, weakness, warm feeling, oliguria, polyurea, thirst. The toxin was thought to be allenic norleucine (2-amino-4,5-hexadienoic acid). However, the toxin is an as yet unknown compound. 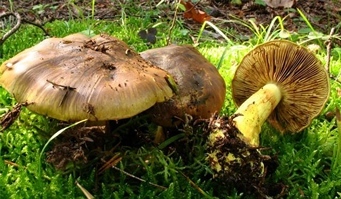 A complex of North American species that resemble the European species, Paxillus involutus, have caused poisonings in North America. It is the third most common cause of gastrointestinal symptoms in Eastern Europe, where is has a long and unfortunate culinary history. However, the main toxic component in P. involutus causes acute immune-mediated hemolytic anemia. Hemolytic anemia occurs mainly in individuals who have eaten P. involutus for many years without ill effect. Because the syndrome is related to repeat, long-term exposure to the toxin, poisonings may likely go unrecognized, with the more likely diagnosis being idiopathic immune hemolytic anemia. It is perhaps warranted to suggest that in cases of idiopathic anemia, especially in patients of Eastern European extraction, that the question of P. involutus consumption be raised. 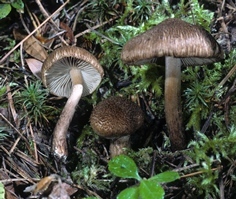 Mushrooms with coprine: Coprinopsis atramentaria (=Coprinus atramentarius), C. insignis, C. quadrifidus, C. variegatus. 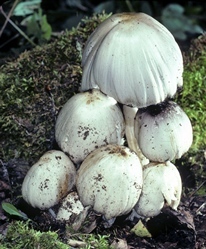 Onset of Antabuse-like symptoms may begin a few minutes after alcohol is consumed by a person who has typically eaten Inky Caps (Coprinopsis atramentaria). The symptoms are tachycardia (racing heart) and palpitations, tingling arms and legs, warmth and flushing, and sometimes headache, heavy limbs, salivation. 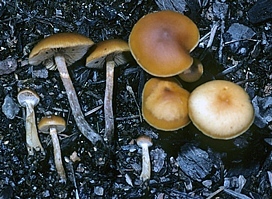 Even alcohol consumption as much as 5 days after eating Inky Caps can trigger the Antabuse-like reaction. Mushrooms: Coprinus comatus, Clitocybe clavipes, Boletus luridus, Morels, Pholiota squarrosa, Armillaria mellea, Pleurotus ostreatus, Boletus edulis, etc. Symptoms include GI distress in susceptible individuals. The delay is up to 5 hours. However, this is not the Antabuse syndrome (see above) of the Inky Cap involving racing heart, warmth and flushing, etc. 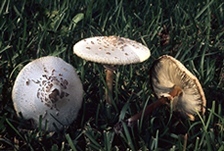 Chlorophyllum molybdites, the green-spored parasol, is the most common mushroom cause of human poisonings in North America leading to severe gastro-intestinal distress, sometimes with blood in the vomitus and excrement. Pets can also be poisoned. Be alert to keep any mushrooms that grow in your yard picked and disposed of (the mushrooms are safe to pick up and throw away). For both humans and pets, intravenous rehydration therapy is most important, with any other symptoms treated on a symptomatic basis. Rhabdomyolysis. Mushrooms: Tricholoma equestre (=T. 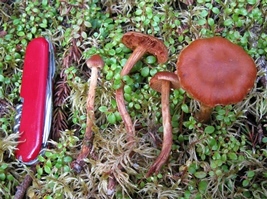 flavovirens), Russula subnigricans. 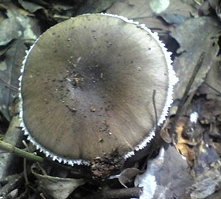 Toxicity from Tricholoma equestre has not been reported from the U.S. and some question whether or not it is dangerous, but consumption of massive quantities of this species in Europe have reportedly resulted in delayed kidney damage, delayed neurotoxicity, and breakdown of muscle fibers with release of myoglobin into the blood stream. The European cases of rhabdomyolysis are associated with respiratory and cardiac (myocarditis) complications leading to death. Myocarditis is an inflammation of the heart muscle. 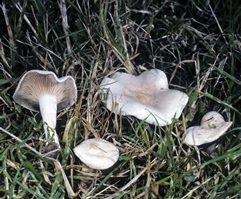 The rhabdomyolysis observed with Russula subnigricans in Japan and Taiwan occurs by a different mechanism than that observed with Tricholoma equestre. Erythromelalgia. 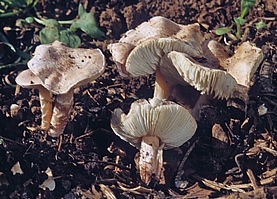 Mushrooms: Clitocybe amoenolens and C. acromelalgia. 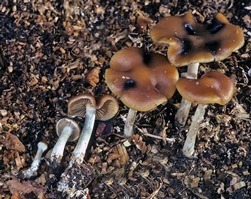 Similar species include Clitocybe (Lepista) inversa, Clitocybe squamosa, Clitocybe gibba, and Hygrophoropsis aurantiaca. 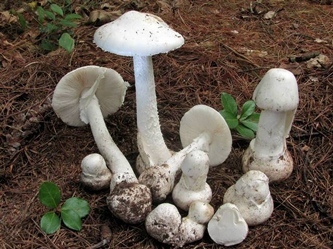 Saviuc and Danel (Saviuc P, Danel V, “New Syndromes in Mushroom Poisoning.” Toxicol Rev 2006; 25(3):199-209) point out that the erythromelalgia syndrome was described as early as the 19th century in Japan and South Korea with Clitocybe acromelalga and since 1996 in France and later in Italy with Clitocybe amoenolens. Erythromelalgia occurs as a result of a maldistribution of blood flow with extremities of the body (typically nose, fingers and toes) calling for more blood and winding up with so much blood flow through various open vessels that hands and feet and nose receive too much and turn bright red, warm to the touch. The situation is very painful and symptoms can last for months. Onset of symptoms is about 1 week after ingestion of the mushrooms and appears to be caused by acromelic acids, compounds that structurally mimic the neurotransmitter glutamate. 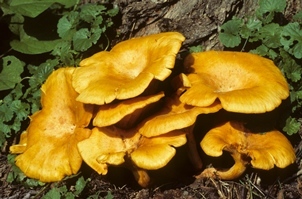 Hapalopilus nidulans and Hapalopilus rutilans (Index Fungorum lists both species, but genetic work seems to indicate that they are synonymous) can contain up to 40% by dry weight polyporic acid (a dihydroxyquinone derivative). Polyporic acid reacts with KOH to give a diagnostic red to lilac to purple color. 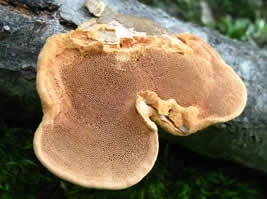 Hapalopilus nidulans is a small, fleshy, drab orangish polypore (sometimes with pale pinkish tones) found on hardwoods in eastern North America and reported to occur on conifers in western North America. Whether the western material is the same species as the eastern material is unclear, but the KOH test indicates the probable presence of polyporic acid (though there are other compounds that can give a false positive reaction). Ingestion of this species can cause kidney dysfunction and brain damage. Simply handling mushrooms can on rare occasion cause a rash and itching similar to reaction to poison oak and poison ivy in sensitive individuals. Reported most frequently for Suillus americanus and similar species. For affected individuals, a rash usually begins about 48 hours after consumption of raw or undercooked Shiitake and lasts for about 10 days. It is a toxic, not an allergic, reaction and is believed to result from lentinan, a starch-like polysaccharide, triggering blood vessels to dilate and leak small amounts of inflammatory compounds just beneath the skin. The rash typically begins as red areas that neither hurt nor itch. Soon red blisters form and then harden over the red regions but the rash is not initially itchy like a poison oak rash would be at that point. The red streaks then turn to purple raised welts which persist for days. The purple welts make the victim appear to have been flogged or to have been vigorously scratching a poison oak rash. 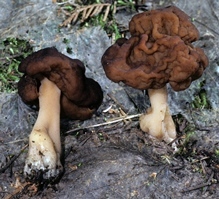 The syndrome was long thought to be restricted to Asia since most of the world’s production of Shiitake [Lentinula edodes (Berk.) Pegler] occurs in Asia. However, a case has recently been reported from Portland, Oregon and there may have been other cases that were not diagnosed. Clinically the rash resembles flagellate dermatitis caused by Bleomycin, a sulfur-containing polypeptide derived from Streptomyces verticillus. Lentinan is decomposed upon heating and so it is only consumption of raw or partially cooked Shiitake that poses a problem. Only 2% or less of the population is likely to be affected. While Shiitake dermatitis itself is a toxic reaction, not an immune-stimulated allergic reaction, consumption a large amounts of raw Shiitake in individuals who would otherwise be unaffected, can lead to an allergic response. Sensitized individuals react strongly when pricked with raw Shiitake but not with cooked Shiitake, indicating that they have developed an allergy. 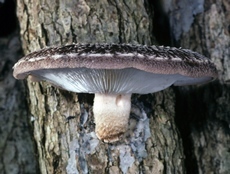 Some workers in Shiitake grow houses develop an eczema-like rash due to Shiitake specific immunoglobulin. There are also documented cases of allergic and chronic hypersensitivity pneumonitis induced by spores of Shiitake.